My name is Kristen and I started working at beautystoredepot about seven months ago. Although I may be the newbie here, I have been fortunate enough to try a variety of products that we carry. 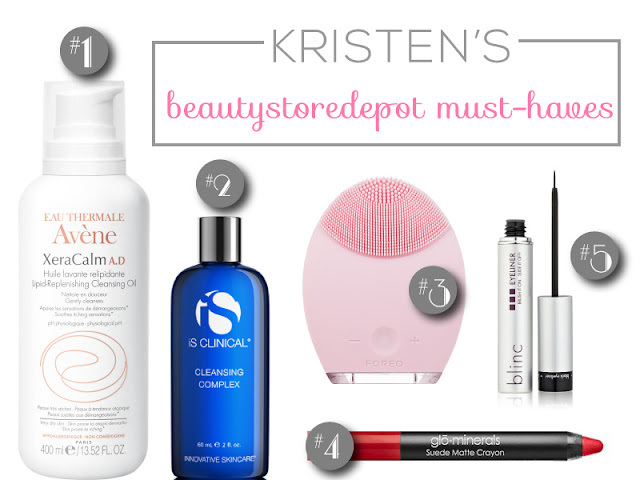 Here is part one of my top 10 beautystoredepot products I'd like to recommend to you! 1) Avene XeraCalm A.D. Lipid-Replenishing Cleansing Oil: Not only am I a beauty guru in training, but off the clock I am a mommy to a sweet four year old boy. Ever since my son was born we have struggled with his eczema and sensitive skin. He tends to have it around his eyes, in the nook of his inner elbow, and behind his knees. After trying every drugstore brand cream/cleanser/topical solution on the market without any success, I finally caved and asked his pediatrician for help. He was prescribed a steroid that I was super hesitant about using on him, especially near his eyes. So, Imagine my relief when I finally found a product that was safe, gentle, and ACTUALLY worked! I am extremely impressed with all of the Avene products and the amazing results that these products provide for sensitive skin. The key ingredient in all of their products is the spring derived Thermal Water. This oil has not only helped alleviate his eczema break outs, but seems to be preventing them from reoccurring at all. We use it about every other day either in his bath tub as a bubble bath, or while washing him in the shower. Paired with the Avene XeraCalm A.D. Replenishing Cream, we seem to have finally gotten his eczema under control after four years. I HIGHLY recommend this product to anyone who suffers from eczema or who has sensitive skin! If you or someone you know is suffering from eczema or a variety of other skin conditions, please, please consider finding out more about how Avene products can help you. This video which is initially heartbreaking really convinced me of how profound this water truly is. 2) iS Clinical Cleansing Complex: This cleanser provides a thorough, gentle, and deep cleanse. It completely removes all makeup and leaves your face feeling fresh and soft. This cleanser is ideal for both men and women, of all skin types. And men, I've heard it’s great for shaving! I've come to realize that, just like Avene, I LOVE everything iS Clinical carries that I've been able to try. This is another great brand that provides phenomenal results and benefits. Did I mention it is paraben free? Also it pairs perfectly with my Foreo LUNA. 3) Speaking of the Foreo LUNA Device... This device has completely transformed my skin since I started using it. What is it exactly? It is a personalized facial-cleansing & anti-aging device that works by using T-Sonic pulsation technology, providing up to 8,000 pulsations per minute. It has two different modes with their own separate benefits. The first mode is to be used for deep cleansing with your favorite cleanser* while rotating the front side of the silicone brush on your face in little circles. According to Foreo it removes 99.5% of dirt and oil while improving the absorption of your favorite skincare products. The second mode and backside has a lower frequency pulsation that is used for anti-aging and is known to reduce fine lines and wrinkles, while also firming and lifting the skin. Since this device uses silicone brushes it is super easy to clean with your favorite cleanser or gentle soap. The silicone will never have to be replaced unlike a lot of similar devices which require you to replace the brush heads every so often. The product is small enough for easy transportation and a full charge will last you about 450 uses. There is also a two year warranty on each device and a 10 year quality guarantee. This device has four different versions to fit every skin type and if you are unsure which would be the best fit for you, we can do a quick consultation with you to determine which type you are. You can view all of these devices here. *please note, do not use an oil-based or exfoliating cleanser with this device as it could damage the silicone! 4) blinc Liquid Eyeliner: I have tried my fair share of different liquid eyeliners, trying to perfect my winged eye look over the past several years, but it seems that each had their own issue that turned me away from them. It wasn't until I started working here that I came across this brand of liner, and I have never turned back! It's a water resistant eyeliner and actually stays on all day without fading, smearing, clumping, flaking, or rubbing off. Also the brush is a perfect width for achieving the desired winged eyeliner look. Several colors are available including dark blue, grey, black, or medium brown. 5) gloMinerals Suede Matte Crayon: When I was initially introduced to the gloMinerals crayon lipsticks I wasn't really much of a lipstick wearer. Ever since using this, though, that has changed. I found that it not only lasted all day, but it does not smear or fade nearly as much as other comparable lipsticks. This crayon comes in 6 different shades for whatever mood you're in and several options to find a color that will pair well with your skin tone. Plus there is a built-in sharpener within the cap, so no need to go out and buy an extra-large sharpener for this crayon. The crayon also has a subtle minty scent to it, which I've grown to love. If you're looking for more of a high shine/glossy finish, you should check out the gloMinerals Cream Glaze Crayon, also with 6 beautiful shades. If you took the time to read through the lengthy part one of my top 10 beautystoredepot products, thank you! It was tough trying to decide on just 10 products to recommend, and I definitely have a lot to say about each. Stay tuned for part two and my five remaining favorite products, to be posted in two weeks. If you have any questions regarding any of the first five products I mentioned, or if I can assist you with any of your beauty concerns, please let me know and I would be happy to help!